Carlos is a Supervisor with SMCO and a licenced EA. When Carlos started out as an intern in 2015, he found he had a passion for tax return preparation, and grew quickly in the firm. He specializes in tax return preparation, bookkeeping, and QuickBooks. 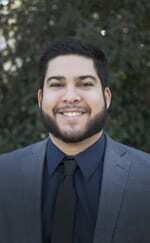 Carlos graduated in 2015 from Cal State San Bernardino with his Bachelors in Administration with an Accounting Concentration. Carlos is passionate about his clients and his work at SMCO. He truly enjoys helping those he works with and is always available to answer a question whether it is from a client or team member. Carlos is a foodie and likes trying new restaurants in his free time. Carlos and his girlfriend have two dogs that they adore. He also enjoys, watching sports, working out and playing soccer.